Knee injuries can keep you from participating in your favorite sport and even performing normal activities like walking. To learn how full or partial knee replacement can help, visit Christopher S. Raffo, MD and James S. Gardiner, MD at The Centers for Advanced Orthopaedics: Maryland Orthopedic Specialists Division. 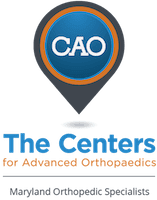 With locations in Bethesda and Germantown, Maryland, the team of highly skilled orthopedic surgeons can help you recover quickly from your knee injury and regain mobility in this critical joint. If you have a severely damaged knee from an injury or arthritis, knee replacement may be necessary to alleviate pain and help you get back to the activities you enjoy. Either total knee replacement or unicompartmental knee replacement can restore function and movement to your joint if medication or other treatment methods aren’t working. With total knee replacement, Dr. Raffo or Dr. Gardiner removes damaged cartilage in the affected area and positions metal implants that recreate the surface of the knee joint. They attach these parts to the bone and resurface the patella (kneecap). Your orthopedist then inserts a plastic spacer between the metal parts to help the joint move smoothly. Do I need the full or partial knee replacement? In a partial knee replacement, only the damaged area of the knee is surgically altered. Some patients who have less severe injuries might be good candidates for a partial, or unicompartmental, knee replacement. This procedure is also effective for patients who have osteoarthritis in the knee. Full knee replacement might be necessary if you’ve severely injured your knee or if all parts of the knee need repair for the joint to function properly. The best way to know whether or not you need a full or partial knee replacement is to schedule a personalized consultation with Dr. Raffo or Dr. Gardiner. With the proper diagnostic tests, they can determine which procedure will provide you with the most effective recovery. Is knee surgery my only option? Besides knee replacement, your surgeon can create a treatment plan that includes pre- and post-surgical physical therapy, which will improve your results and help you heal faster. What can I expect after knee replacement? Your knee function should return quickly after a unicompartmental knee replacement, usually after about 2-4 weeks. With full knee replacement, you can expect to return to normal activities within about 6-8 weeks. Working with your surgeon and physical therapist, you can expect to regain your full range of motion while strengthening and conditioning your new knee. To schedule a knee replacement consultation, call or book online today.